With the housing market on the rebound, NNA 2013 Conferenceattendees will have a golden opportunity to position themselves to take advantage of the improving economy. The conference program includes on-site training to become an NNA Certified Notary Signing Agent. Education and certification are becoming important elements for success in the signing industry, and in this increasingly regulated environment, major companies such as First American Mortgage Services prefer to hire NNA Certified NSAs. The NSA training will be divided into two sessions — conducted by an expert NSA guest presenter — and both are required for certification. Texas Notaries may choose to take the Texas state certification examination and undergo background screening immediately following the course, for a discounted fee. Notaries from other states will go home confident that they have received the training necessary to “ace” the examination in their home state. Apart from Certification training, NNA 2013 also is offering a variety of specialized workshops for Signing Agents — whether you are brand new to the industry or a seasoned veteran. NSA newbies, for example, can attend a workshop that walks them through each step of a loan closing, while experienced Signing Agents can learn how to improve their marketing efforts. With just a few weeks left before Conference, registrations and hotel rooms are filling up. 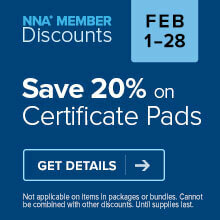 If your 2013 goal is to expand your Notary horizons, don’t delay — register for NNA 2013 Conference now.